1,652 years of Christian worship may soon end – ISIS is four miles away. One thousand, six hundred and fifty two years ago, this monastery was founded: 1,652 years of Christian prayers, of continuous history, theology, writing, teaching. Aramaic, the language of Jesus Himself, is still spoken here by the monks and many refugee families who have fled here. And now this too risks being obliterated. Monastery of St. Matthew (CBS NEWS). Nestled on the side of Mount Maqlub in northern Iraq, overlooking the Nineveh plains, sits Mar Mattai (St. Matthew) Monastery. Founded in 363 A.D. and just 20 miles north of Mosul, it houses one of the most ancient Christian libraries in the region. At one point the monastery was home to 7,000 monks, but now there are only three monks and six students to ensure life and prayer continue inside the ancient walls.And they have cause for concern. The Islamic State is just four miles away. 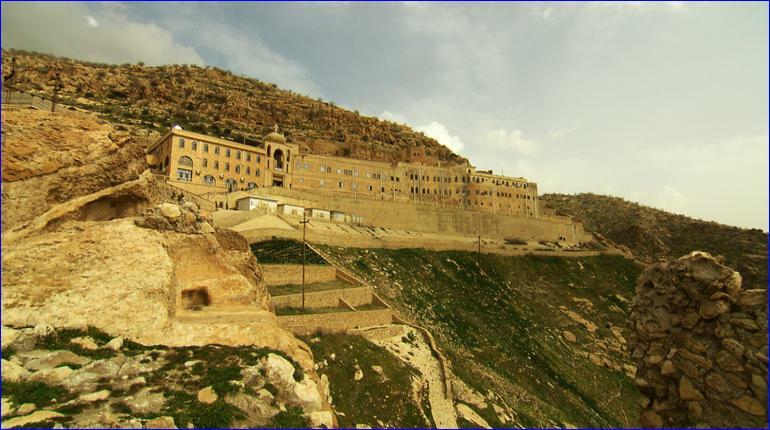 Mar Mattai Monastery is the oldest Syriac Orthodox monastery in northeast Mesopotamia. Situated near the town of Bartella, it relies on the Kurdish Peshmerga and Christian self-defense forces as the last line of defense. However, these fighters most likely would not be able to hold out if confronted with an all-out assault. There is reason to fear that might occur. In the past year Jonah’s tomb in Mosul and the ancient Christian Mar Behnam Monastery in Qaraqosh were destroyed by ISIS (Islamic State in Syria) along with many more artifacts from all religious denominations. Not only was Mar Behnam theologically connected to Mar Mattai, it displayed a magnificent architectural blend of Christian and Muslim art. Inscriptions on the walls were written in Syriac, Arabic, Armenian and Uighur. Yazidis revered this site as well. Unfortunately, Mar Mattai Monastery could meet a similar fate. According to U.N. officials, on the night of Aug. 6, 2014 roughly 200,000 Christians fled their homes on the Nineveh plains. Fleeing with them is a language spanning back thousands of years in the region. According to Father Douglas Bazi, a priest in Erbil who runs schools for refugees fleeing the Nineveh plains, Mar Mattai hosts families who escaped Mosul and many more who were forced to flee from the surrounding towns. The people still speak Aramaic — the language spoken by Jesus — an ancient language with nearly three millennia of continuous records. Only Hebrew, Chinese, and Greek have an equally extensive written history. The deliberate extinction of a language and culture is unfolding in real time. Where is the outrage from the international community? Such treasures disappearing are not only a loss for the community but also a loss for civilization as a whole. Cries for action have lowered to a whisper. The silence is deafening. Make your voice be heard. Please write to your Senator or Representative and ask that our government would intervene more strenuously, give more help to the Christian forces, accept those Christians who are fleeing. Pray daily that jihad will be turned back and these, the descendants of the apostles, be spared, that moderate Muslims will abandon their silence and act to end the madness. Holy martyrs, pray for us. « Why Silence on the Genocide of the Christians of Syria-Iraq?